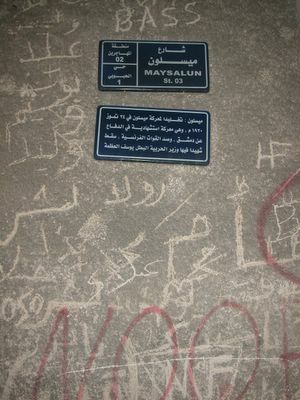 Maysaloun Street: In memory of the Battle of Maysaloun, a suicidal battle fought on July 24th, 1920 to defend Damascus against French forces. Defense Minister Youssef Al-Azmah was martyred during the fighting. Although he knew that his poorly-equipped army will be overwhelmed by the French, Youssef Al-Azmah, Defense Minister of then newly independent Syria, did not want Damascus to be an easy get for General Gouraud, so he led 4000 men to fight the French army at Maysaloun, 25 km to the west of Damascus. The battle lasted for a few hours, the Syrian army was defeated and Al-Azmah was killed. For Syrians, he became a symbol of courage, sacrifice and dignity. Al Azmah was a true hero. Is there a statue of him anywhere in Syria? Isn,t there asqware for yosseff alazma in damscus?. I hope recent day officials take an example of what meant sacrifice of Azameh to them. What really touches me is his title "Minister of Defence".... Just like the old days! I wonder what our current minister, the one before or the one after are willing to sacrifice with! Omar, yes there is a statue for him in Damascus, in "Youssef Al-Azmah" Square. OK. We know who is who Al Azmah is, but who are the other guys: Rola, Bishr, Walid, Wassim,.... :) and there is a name is graffiti that I couldn't figure out! To keep fighting even when we know the odds are unbeatable is true courage. It's not about how we live but HOW we live and how we die. Well, I'm now in Paris, and I don't think thatthere's any mumorial for a Syrian here, 3azmel or anybody else (even there's a street by the name of the King Houssen of jordan, and King Hassan of Marocc), because the France for some rison try to hide these episode of time when it was occupiing other countries, and now, almost all new jeneration, and I mean those from 40 years and smaller, don't know that France were ruling in Syria and Lebanon. they hide the dark side in their history as any other country in the world! 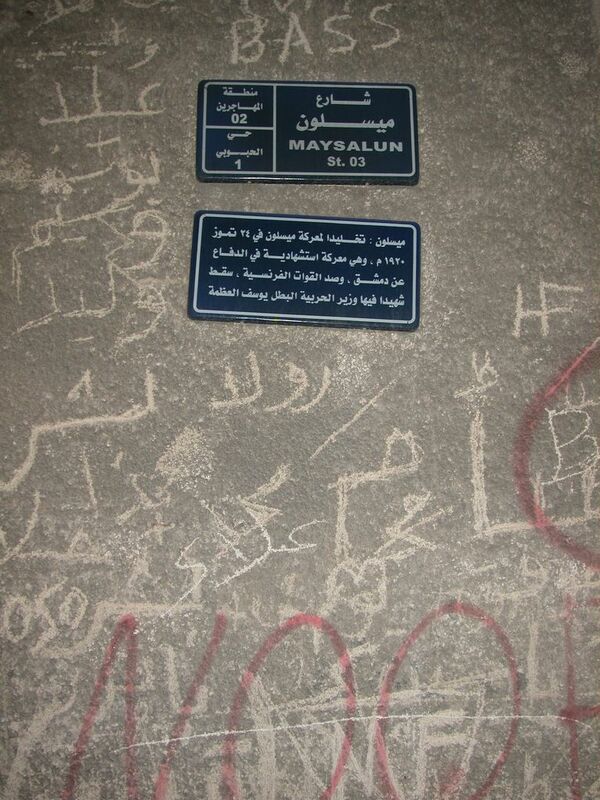 Anonymous and Yako, I have never heard of anything commemorating Yousof Al-Azmeh in Paris. Unfortunately, in the long and dense colonial history of France, Syria - and more specifically Maysaloun - accounts for very little. I'm not sure that this is a delibrate cover up as Yako seems to believe. The French are still questioning their Algerian history which, we have to admit, had more impact on the French society and politics. I believe that it is up to us who know Al-Azmeh's story to remind France and the rest of the world of who he was. For instance, did the Syrian Cultural Centre in Paris launch any activity (seminar, conference, film project, meal, you name it!) commemorating Al-Azmeh? Of course not. By the way, some sections of the Centre's site ( http://www.centreculturelsyrien.com ) haven't been updated since 2003. And if you click at the "Galeries" link, you'll see a map of Syria with Palmyra and Apamea misplaced on the map. I'll check how an article can be created, then you are welcome to contribute. Ayman, thanks for having mentioned Yusuf Al-Azmah in the first place. Yako, we are on the same wavelength. No problem. Actually, the French don't understand the difference between "mandat" and "protectorat" for instance. Syria being one of the countries on the receiving end of colonialism, the Syrians had to learn at school about that difference. The French know nothing about what is probably the ultimate failure of their mandate, and indeed a very symbolic failure - the attack on the Syrian Parliament on May 29, 1945. Only a chosen few (an élite) would know that a fellow called Gérard Degeorges wrote two interesting books about Damascus in one of which he mentions the colonial history and its ideological background extensively. Definitely a recommended read. However, whether we like it or not, we find ourselves with the duty to inform. It is in that context that I mentioned the Cultural Centre and its lack of activity. The Arab World Institute is doing a good job in showing different aspects of Arab culture(s) and re-humanise Arabs. "Sat. Oct. 11 [11 October 1919] Went with 'Izz ud Din to the Madrasat Banat al Shuhadah which is run by a philanthropic society of which the President is Naziq al 'Abid. She is a very remarkable girl of about 20, speaking fairly good English which she learnt at Beyrout [Beyrouth (Beirut)], daughter of Mustafa Pasha al 'Abid and granddaughter of 'Izzat Pasha. She is engaged to 'Izz ud Din and sees him freely unveiled. Her mother was also there, unveiled, and another young woman of the oeuvre, ditto, though Izz ud Din, Hamdi Beg and one or two other men, not relations, were there. The 'Abid family are however the most liberal in these matters. The school well kept and clean, the children charming. Besides the orphans they admit paying pupils. A small and chetif son of the Amir 'Ali among the number. Most of the teachers Christians. Naziq thinks we could get a Raisah for about £20 a month. They danced and sang patriotic songs - a sort of dialogue between the ladies of the oeuvre and the children, the former reminding them that their fathers died for the Arab cause and that they are bint ul 'Arabi, the latter replying that they will never forget their liberation by Husain and Faisal. Also a verse in praise of Wilson a l'usage[?] of the American Commission." Very interesting information, Gottfried. Thanks for adding Al-Azmah to Wikepedia. I didn't know about Nazek Al-Abed at all. Even we, Syrians, can be ignorant about our history! I agree that we should do a lot more to commemorate our national heroes. Even in Syria, for various reasons, Al-Azmah like many other great people who shaped the history of Syria are not honored the way they deserve. This might be off subject. But Anon 8:45 saying that he heard that Al-Azmeh is commemorated in France remind me of the story of Suleiman Al-Halabi. He was a Syrian student in Cairo who assassinated a French general Kleber during Napoleon's occupation of Egypt. The French arrested him, and he was executed in public in a barbaric way. His corpse was taken to France and his skull was displayed, for years, to students of medicine, who were shown the 'bump of crime and fanaticism', before ending up in the Musée de l'Homme. Shouldn't Syria demand that the skull be returned to Syria and reburied in an honorable and respectful way? Ayman, you're right to mention that. I'll try to know more about the skull: which section it is in (I think "anthropology") and how its owner is presented. I'll keep you all posted on that. Thanks for all the great info, to all those who contributed. I, as Ihsan said, wonder the same thing. Are our current or future ministers as patriotic as they used to be? Stellar and Ihsan, try to compare Al-Azmah to our longest-serving defense minister who, while assuming the responsibilities of defending a country that is officially at a state of war, wrote tens of books, including 3 volumes of memoirs, each consisting of more than 500 pages, in addition to poems dedicated to Georgina Rizk (Lebanese Miss Universe 1971), Sophia Loren and others. One of his books is a collection of love letters he received from his female "admirers" around the world. ther are many heroes in the arab and syrian histery you mntioned them previously ,the morocans who came during the 1973 war,JOLJAMMAL a syrian from lattakia who deffended agypt during th 1956 invasion, many others fought the french during their occupation.GOD BLESS SYRIA AND IT,S PEOPLE. If we really wish to look for heroes, I think that the average Syrian trying to make ends meet and to feed himself and his family without bribing or being bribed is a hero just for doing that. I second what Gottfriedstutz said @ 0919 and would apply it to all Arabs whose countries are unfortunately infected with the culture of rishwa & istibdaadi! Therefore all ordinary Arabs are also heroes! … nous nous arrêtons à Maysaloon, lieu du baroud d’honneur dans lequel ont péri 800 patriotes menés par le ministre de la défense, Youssef el Azmeh, qui ne pouvait accepter que son pays se couche devant les Français sans opposer une quelconque résistance. Désobéissant à son roi (Fayçal), il se porta à leur rencontre avec 3000 volontaires pour livrer une bataille perdue d’avance. Les Français, au nombre de 10 000, étaient équipés de tanks et d’avions, les Syriens, n’avaient parfois que des bâtons. Yousef el Azmeh est sans doute le héros favori en Syrie. A l’école, notre professeur pleurait en racontant son histoire. Also, thank you for what you have been through in Iraq. Back to your blog entry about Maysaloun, and only for the sake of precision, Youssef Al-Azmeh was "ministre de guerre" not "ministre de défense". Not that it would have any impact, but I guess that it makes Ayman's comparison with present day "heroes" even more ironic : A minister of war takes his job of defense very seriously while a minister of defense seems to regard his primary role as the last of his occupations. Why do not we care more about Salahhdeen tomb . Why Shukri Alkoouatli's house is clsoed , while it deserves to be a meuseum ... in the memory of one of the sinceres who ruled this country . and Why one of the two Syrian great national days pass like this with a minimal mention in our media - raf3 3atab- I mean Maysaloun Anniversary . the other great national day is Independance day . "a suicidal battle " .